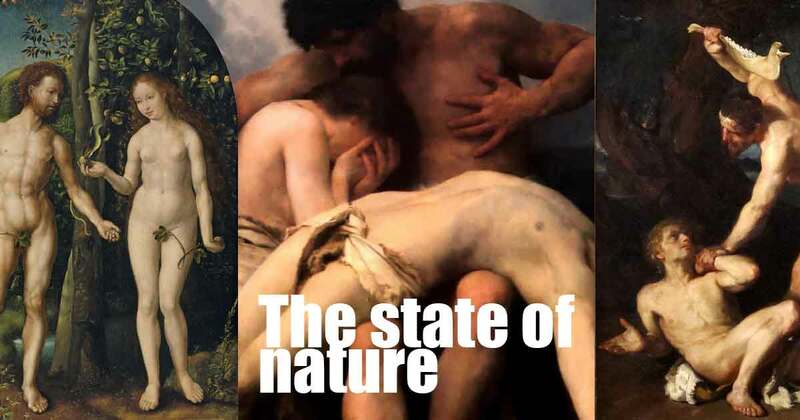 The state of nature is the state humans lived in before forming the first societies. By examining the state of nature, we can better understand the implicit and explicit social contracts which govern societies. Social structures become clearer if we look at the way people live in a state of nature, examine what natural rights and liberties they enjoyed, and see what natural threats they faced. We can understand why people form societies through this excercise as well as the purpose of government and whether a given civil law or leader is just and unjust. The state of nature is a state of war (Hobbes). The state of nature is a state of peace (Rousseau and Montesquieu). We will explore these realist and idealist positions, the scientific data we do have, and the related dilemma below. War & Human Nature: Crash Course World History 204. A good overview of the topic. TIP: This page is part of series about the social contract. See an overview of social contract theory and the state of nature. Hobbes, Locke, and Montesquieu. This video is good in content if not in visual quality. Hobbes and the State of Nature. Where Does the State of Nature Argument Originate? Aristotle wrote about “the state of nature.” In his 350 BC work, Politics, he described the state as a naturally occurring social system where people form units of increasing self-sufficiency. Alone, families a barely self-sufficing entity When several families unite to form tribes they become somewhat self-sufficient. Finally “the state” is a larger union and a fully self-sufficing entity. In the late 1500’s, James I of England / IV of Scotland, King of England, Scotland, and Ireland, had a discussion with his tutor, the somewhat radical liberal Protestant George Buchanan. Buchanan was known as one of the greatest minds of his time. Their debate ranged around an early version of the state of nature argument and the interrelated social contract argument. Read more about Where Does the State of Nature Argument Come From? Is the State of Nature the State of War, or the State of Peace? Now that we know the origin story of the argument let’s focus on the major social contract theorists to describe the argument between the state of nature as a state of war or a state of peace. Hobbes: The state of nature is “a war of all against all” (actually says: “Warre Of Every One Against Every One”), the life of man solitary, poore, nasty, brutish, and short. “In Such A Warre, Nothing Is Unjust.” See Leviathan (1651) Chapter XIII (13). Locke: Agrees with Hobbes, but says we have natural rights, including the right to life, liberty, property, and the consent to be governed. See Second Treatise of Government (1689) chapter 2. Hobbes and Locke see man as naturally having a bad streak, and see government as that which protects individuals from individuals. The difference is Hobbes thinks leaders should have absolute power and Locke thinks they should have limited power. TIP: Early political theorists who touch on Hobbes’ points include Aristotle‘s rivals the sophists. They thought that the state arose simply by convention.. King James I‘s 1597-98 wrote The True Law of Free Monarchies (or, The Reciprocal and Mutual Duty Betwixt a Free King and His Natural Subjects) and Basilikon Doron (His Majesties Instrvctions To His Dearest Sonne, Henry the Prince). In these works, James presents down the Divine Right of King’s argument for the what might be the first time in modern discourse. Rousseau: In the state of nature man is a peaceful, noble savage. Man is born free and everywhere he is in chains. The most ancient society and the only natural one is the society of the family. This is the best example of a basic social contract. Another contract theorist, Sir Robert Filmer agreed but drew a different conclusion. See The Social Contract (1762) Book 1. Montesquieu: The savages found in forests “tremble at the motion of a leaf, and fly from every shadow.” People aren’t naturally at war; they are naturally in “flight mode.” They fancy themselves too inferior to attack another. The idea of empire and dominion is so complex, and depends on so many other notions, that it could never be the first which occurred to the human understanding. See the Spirit of Laws (1748) Book 1. Rousseau and Montesquieu see man as naturally good, and society and possessions as corrupting. Both believed that laws represent and protect the people’s natural goodness and their natural General Will. TIP: Two other works that present the state of nature as a state of peace and cooperation are: Aristotle (Politcs 350 BC) and Buchanan’s 1579 work De jure regni apud Scotos (The Powers of the Crown in Scotland; or, A dialogue concerning the due privilege of government in the kingdom privilege of government in the kingdom of Scotland). Is man naturally good or bad? Is the state of nature a state of war or peace? Why do people form families, tribes, states, and governments? How much power should leaders have, should this power be based on consent, and are there natural rights which should never be violated unless one violates the implicit social contract? Is a leader’s power absolute? To what extent is a monarch’s power absolute? To what extent is it divine? What is the difference between despotism, tyranny, and monarchy? Is there an enforceable implicit social contract in the first place? Is the State of Nature the State of War? It is difficult to tell which of these thinkers are correct, as it’s been very roughly 7,000 years since the first proper societies formed during the Neolithic Revolution. It has been 5,000 years since people began writing things down. If we look around the world using archeological and anthropological data and factor in what we know, we can make some conjectures. We can’t look at people without families or tribes, but we can look at unconnected tribes who have avoided civilization. We can examine the most isolated tribes to see if they war, if they form families, if they are patriarchies, and if they have systems of reciprocity. 15 Isolated Tribes Cut Off From Modern Society. A tribe is a rudimentary society, so this isn’t “a pure state of nature” still, as we can see, some war and some don’t. People are not very consistent. This gives weight to Hobbes’ theory as one bad apple spoils the bunch. Did Hobbes Say “Bellum omnium contra omnes“? Is the State of Nature a War of All Against All? Hobbes wasn’t suggesting everyone was at war literally; he was only pointing out that some were. Thus, everyone lived in constant insecurity. Hobbes’ goal is to prove that absolute monarchy is needed based on the state of nature. Whether he does this or not is a matter of opinion, but we can clarify that the main theme is one of insecurity and uncertainty, not literal constant war. In this, he isn’t too far off from Montesquieu who himself is misunderstood often. TIP: Locke doesn’t present an alternative theory. Instead he plays off Hobbes while coming to different conclusions. Is the State of Nature the State of Peace? Rousseau thought we only needed to look at the Native Americans to see that man was a “noble savage.” He never said those words exactly, although he described the concept. As soon as the Europeans brought mirrors, alcohol, money, and other vanities, the natives lost their pureness and were corrupted. Thus, he came to the conclusion that it was possessions and society that corrupted and that the goal of the social contract was not protection, but the preservation and fostering of man’s natural goodness. This would be man’s General Will if he could decipher it. TIP: Rousseau essentially sums up Montesquieu’s theory. Donald Kagan on War and Human Nature. A Yale classical historian discusses war and human nature. The state of nature is a state of both peace and fear. People are good and bad, and the groups they form are good and bad depending on factors of culture and environment. We can consider people before societies, but it is hard to consider people before a family. A strong case can be made in either scenario that cooperation and competition both play key roles. Despite the fact that we can use our reason and the law to live in an advanced civilized society, if “some war” then, The Prisoner’s Dilemma tells us a lot of what we need to know about the purpose of government and the state of nature.